Ever since Six Flags AstroWorld closed in Houston, Texas the area has been without an amusement park. That won't last much longer with the new and highly anticipated Grand Texas Theme Park. Officials of the proposed park have set an opening date of summer 2015 but this won't be your normal amusement park. 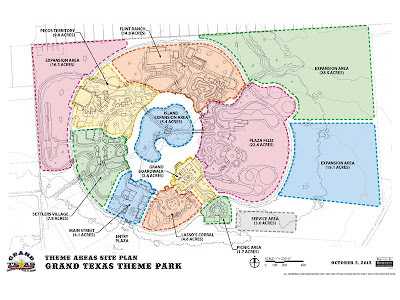 This park is going the full 'theme park' route and without Six Flags in the mixture, it's likely to be a success. Developer Monty Galland and CEO Chuck Hendrix have stated they want a family friendly complete district which you can spend more then a single day enjoying. The park will open on 150 acres with room for future expansion. The theme park its-self will draw from local Texas history for it's seven themed lands. Officials state some of the theme will be- The Grand Boardwalk aims to be themed as turn-of-the-century fair. 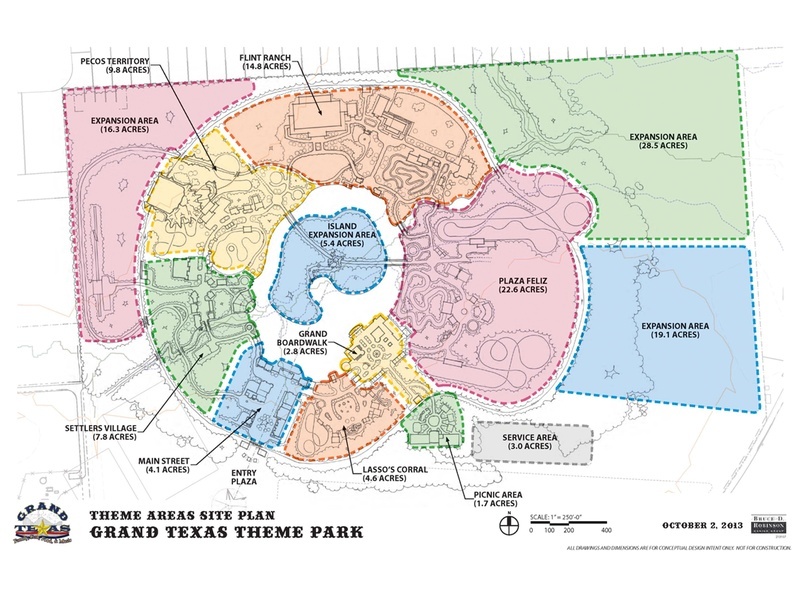 Yet the Pecos Territory will contain most of larger thrill rides. Main Street will give a more romantic look at Texas' past, going more for fun over historical accuracy. Rides are obviously going to be a massive part of this new proposed park but little information exists about them so far. They will also have their own waterpark called "Big River Water Park" which will be themed as a "quaint 1800's fishing village" and said to be located on 40 acres of land. Currently no information is known about what attractions the waterpark will contain or when it's projected opening date may be. On the rest of the 480 acres, the park will build additional goodies for guests and locals alike. It will have a massive retail area, many restaurants, two hotels as well as an RV park. As for entertainment the park plans for a possible 3 different sports venues, not much detail on that right now though. There is also no current time-line on these additional areas, just the opening date range of the theme park. Mr. Hendrix was the final CEO of Six Flags AstroWorld and the man most people blame for it's demise and destruction. With this new proposed park, he states he wants to leave a different legacy to the people of Houston.